Best Oil for Harley Davidson Motorcycles Reviews: Top-5 in April 2019! All motor engines require oil to lubricate their moving components for performance and to retain structural integrity. Oil is also a major contributor to exhaust pollutants so its imperative that the oil you choose for your Harley Davidson motorcycle is optimized for that specific application. You might think that an engine is an engine and what the hell, but you are wrong, every engine is designed for different oil types, in fact some engines are very particular to the engine oil you use, the older engines will not work as well on synthetic oils as they do on mineral, and the same applies to modern engines that must not touch mineral oils, and only use specific synthetics designed for them. Mineral oils are the original crude oil refined for engine use. They are the least expensive of the oils and are mainly used in vintage bikes. Semi-synthetic oils are a mixture of synthetic chemicals with refined crude oil. These are the middle ground oils that combined best of both compounds into one formula. They deliver the premium performance of synthetic oil at a price similar to mineral oil. Full synthetic oils are made from chemical compounds mixed together to produce a specific performance grade. As such, synthetic oils can be made to meet very specific requirements as well as be produced for a focused range of applications. They are, as such, the most expensive oils on the market. Synthetic oils perform the best since they are tailored to meet specific requirements, there is a vast range of synthetics to choose from, and in this article, I present to you the five best engine oils for Harley Davidson motorcycle applications. 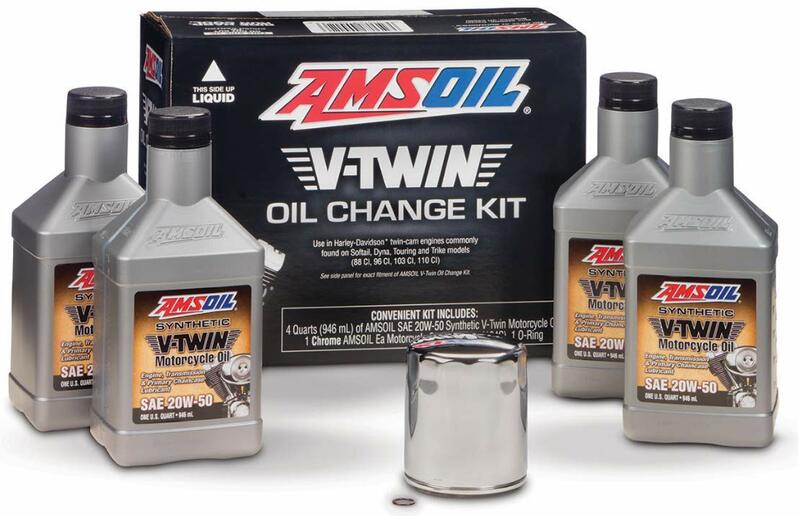 This is the AMSOIL 20W-50 Synthetic V-Twin Motorcycle Oil that is specifically designed for Harley-Davidson V-twins. AMSOIL was the first company to produce an API-qualified synthetic motor oil in 1972. With this exclusive pedigree in innovation and continued research into improving performance, its no wonder that AMSOIL has one of the best Synthetic oil ranges on the market today. This oil reduces engine scuffing after 250 hours, over 13,647 miles. Another effect that this oil has is its thermal properties. V-twin engines run extremely hot in the summer, AMSOIL Oil is a natural heat-resistant synthetic based oil that resists oxidation in extreme heat. Other properties of this synthetic oil include transmission and primary chaincase protection with its stable shear characteristics. This is due to its gear lube type performance that doesn’t deliver the negative effects of extreme-pressure additives. It also contains anti-rust additives preventing rust in ferrous components. This oil is used for Harley-Davidson engines that require 15W-50 or 20W-50 oils. This is a top-level synthetic oil from a company that presented the first true synthetic oil product on the market. 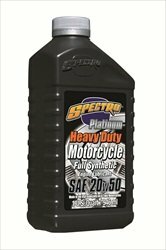 Spectro Heavy Duty Engine Oil is 20W50 synthetic oil developed for Harley® V-Twin engines. The Spectro Heavy Duty oil was developed primarily for Harley Davidson applications, as such this superior synthetic oil delivers exceptional performance grade activity specifically tailored to the Harleys heat output and mechanical movements. This brand comes with advanced anti-wear, anti-carbon additives mixed into a formulation that extends component life, reduces wear, and eliminates valve sticking. This brand model meets all known OEM warranty requirements. Exceeds A.P.I. SF/SG – CD/CG – 4. 3. 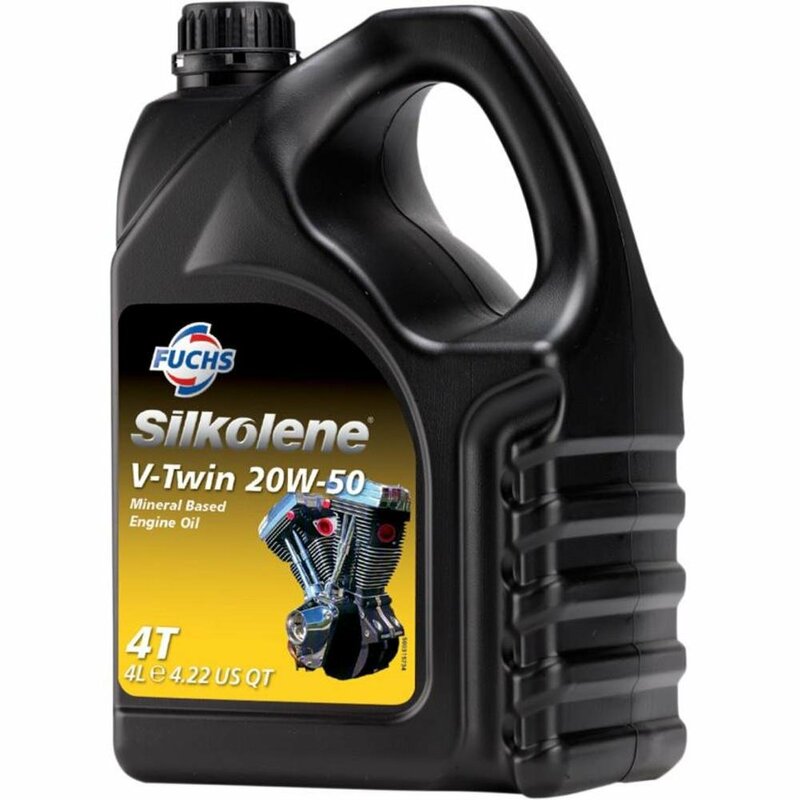 Silkolene 600868413 V-Twin Engine Oil – 20W50 – 4L. This is the Silkolene V-TWIN 20W-50 High Performance Motorcycle MIneral Oil for all Harley Davidson applications. Silkolene V-TWIN 20W-50 High Performance Motorcycle Oil is a classic mineral oil designed for all Harley Davidson engine formats, old and new. Since it’s a mineral oil, there are no synthetic additives, as such, this is a basic refined crude oil. Provides protection over a wide range of operating conditions. Specification: API CF, API SG/SH/SJ and JASO MA2 Approved. A very inexpensive oil for most older Harley Davidson models. This is the Shell Rotella® T6 Full Synthetic Diesel Oil 5W-40 for Harley Davidson applications. 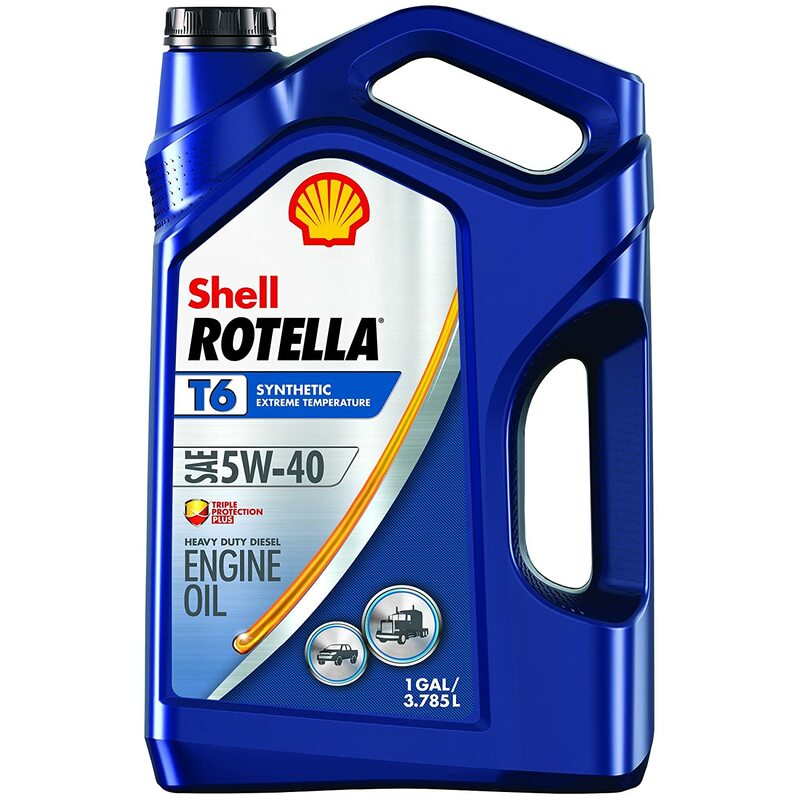 Shell ROTELLA® T6 5W-40 is a Synthetic Heavy-Duty Engine Oil with Triple Protection Plus™ technology. This is Shell’s way of stating that the synthetic formulation is designed to exceed API CK-4 performance standards. As such, the Shell Rotella® T6 5W-40 provides Better Fuel Economy, and enhances the economy of fuel consumption by 1.5% when compared to 15W-40 oils. There is also an Improvement in Wear Performance as well as an improvement in Deposit Control. The current Shell Rotella® T6 5W-40 formula combines a number of advanced multi-functional dispersant additives that combine with the synthetic oils to produce a sever protective characteristics against contaminant accumulation. This brand comes with an Improved Heat Resistance formulation and this helps with an Advanced low-ash characteristic that allows the oil to work in a wider range of temperatures while reducing pollution. The final outstanding performance factor is the oils shear stability that Outstanding Shear Stability resists viscosity loss maintaining optimal pressure throughout the engines performance. It’s Shell, what more needs to be added. This is an exceptional dyno proven synthetic oil that outperforms many of its competitors, and this is based on Shells’ constant scientific research into improving engine performance oils. This is the Castrol® POWER1® 4T 20W-50 synthetic formulation that is designed specifically for Harley Davidson OEM specifications and is bespoke for most V-TWIN motorcycle engines. 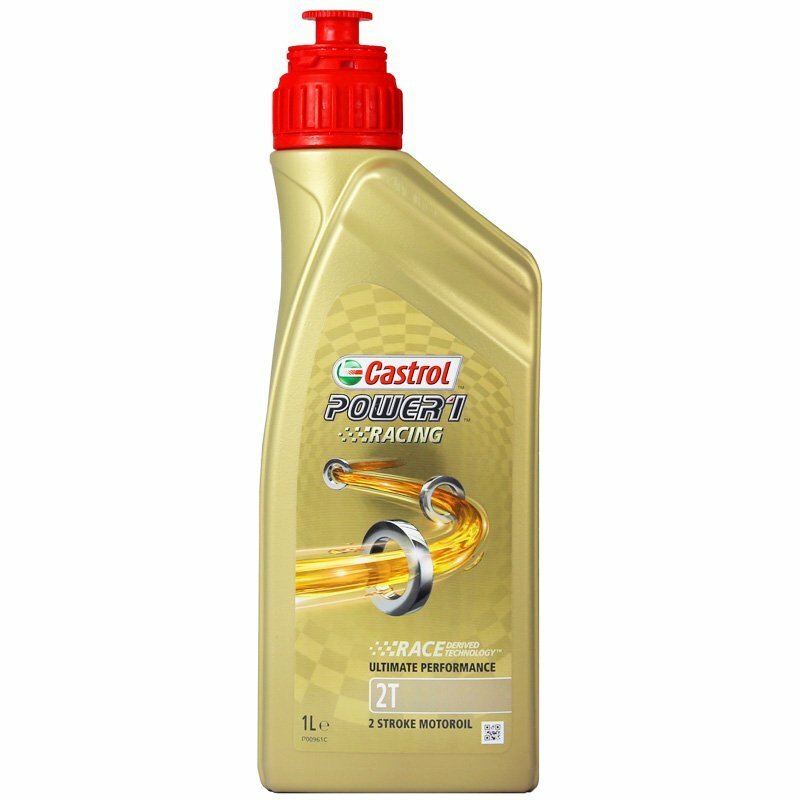 The Castrol® POWER1® 4T 20W-50 synthetic is another classic brand name of oil. It’s a Castrol, so it’s a leader like Shell and delivers similar prophesies and characteristics of performance. The Castrol POWER1 V-Twin 4T comes with their proprietary TriZone Technology™. This technology is the culmination of matching a full synthetic 4-stroke motorcycle oil to a modern V-Twin engine, transmissions and primary chaincases. To be even more specific, this is a Harley-Davidson® motorcycles bespoke oil. When you get such a focused oil, you cannot get any better performance out of the engine upon application. Therefore, the Castrol POWER1 V-Twin 4T 20W-50 will deliver excellent oil flow over a wide temperature ranges, and it is tested to deliver excellent protection against thermal breakdown, and viscosity issues while performing at higher temperatures. It’s a toss up between Shell and Castrol, I like them both, and use both of them. This particular brand is specifically formulated for Harley Davidson motorcycles, so I do use this one more than most others. I also recommend it for all V-Twin engine applications. There are many oils that perform excellent with Harley Davidson motorcycles, including the Harley Davidson oils themselves. However, when it came ta o choice, I had to break down the cost versus efficacy of the oils and the above list is what I cam up with. Each oil was dyno tested and delivered specific results, when compared with the price offered, proved to be the most cost effective oils for all Harley Davidson applications. That is why there is a mineral oil in the list, since it has been proven to be the best for all the old Harley models that will work better with an old mineral base than the more modern and technologically advanced synthetics. Performance Exhausts for Harley Davidson – Buyer’s Guide!